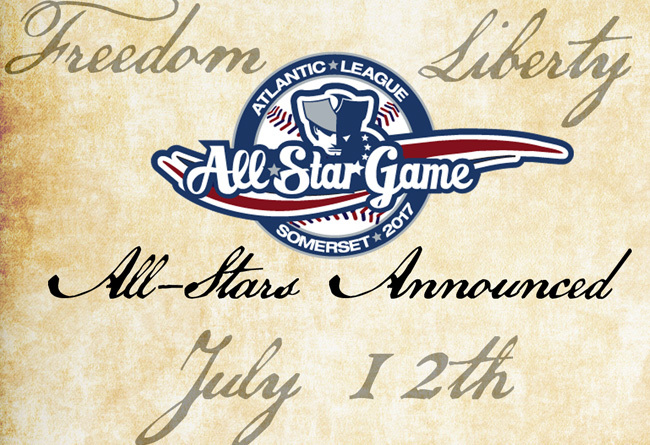 The 20th Atlantic League All-Star Game will take place on July 12th At TD Bank Ballpark in Bridgewater, N.J.
(Bridgewater, N.J., July 3, 2017) – The Atlantic League of Professional Baseball have announced the Freedom and Liberty Division All-Stars selected to play in the 2017 Atlantic League All-Star Game to be hosted at TD Bank Ballpark on Wednesday, July 12th. The All-Star festivities will begin at the ballpark at 5:00 pm, with the game scheduled for 7:10 pm. Both squads will feature 22 players, including 13 position players and nine pitchers (rosters at end of this story). Players were chosen by a combination of balloting of league and team officials, managers, media representatives and fan voting. Nearly 35,000 ballots were cast by fans to help choose this year’s squads. The home Liberty Division is made up of eight Somerset Patriots, five Bridgeport Bluefish, five Long Island Ducks, and four New Britain Bees. The team will be managed by Somerset’s Brett Jodie, who guided his team to the Liberty Division First Half Championship and a league best 42-28 record. In his five seasons as manager of the Somerset Patriots, Jodie’s teams have made the playoffs every year. He won Atlantic League Championship and Manager of the Year honors in 2015. The visiting Freedom Division consists of seven Southern Maryland Blue Crabs, six York Revolution, five Lancaster Barnstormers, and four Sugar Land Skeeters. Sugar Land’s Gary Gaetti will manage the squad after leading the Skeeters to their first championship in 2016. The 20-year Major League veteran is the only manager in Sugar Land history and was named Manager of the Year in 2013 when his team set a league record with 95 wins. The 2017 Atlantic League All-Star Game is the premiere event of the summer, hosted by the Somerset Patriots at TD Bank Ballpark on Wednesday, July 12th. The event is presented by RWJBarnabas Health and Horizon Blue Cross Blue Shield of New Jersey and will feature the biggest Fireworks Show in ballpark history, commemorative giveaways for all ages, entertainment from the ZOOperstars and Birdzerk, and a Home Run Derby before the game. For tickets, stop by the ballpark, call (908) 252-0700 or visit www.somersetpatriots.com.